The big ole' clip on earring I bought looks good in its second life as a "brooch" ( i think i'll engineer a way to have it a bit lower on the guard than this pic--as in below the camica at least). I took the liberty of adding a bit of huge gold-link chain I had from an undergrad toga party (don't ask) in the loopy style of the time. Okay, its only SORTA the style of the time, as theirs would be a full necklace looped over (see portrait above), and mine mysteriously disappears into my bosoms. Hey, the chain was short. Anyway, I wanted to know my public's (i think my public right now is about 3) opinion of this. 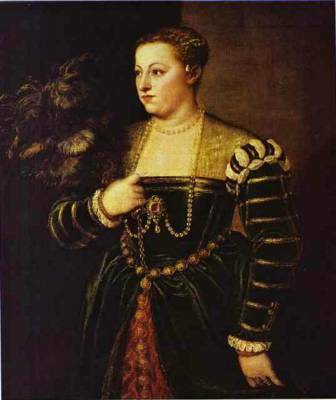 Short chain, or should i string a long thing of pearls, like the lavinia portrait? I still like my earrings (the ones on my ears), but now with the whole ensemble, the necklace I was originally so excited about seems to not match my other jewelry. Its copper colored metal (all my other stuff--sleeve buttons, ouches, brooch--is gold), and its got really stand-out-sparkly rhinestones (everything else is subdued gold and pearls). A shame, cuz I really love this necklace. But it just doesn't match. I set to making new one. A very simple new one. Cuz I'm lazy. ;-) Its creamy pinkish pearls interspersed with ivory whitish smaller pearls. With some silver ones and a leftover teardrop from a goodwill earring. The clasp is something I picked up to use in my girdle but then didn't. So i guess it was leftover too. My, we have been busy, haven't we? 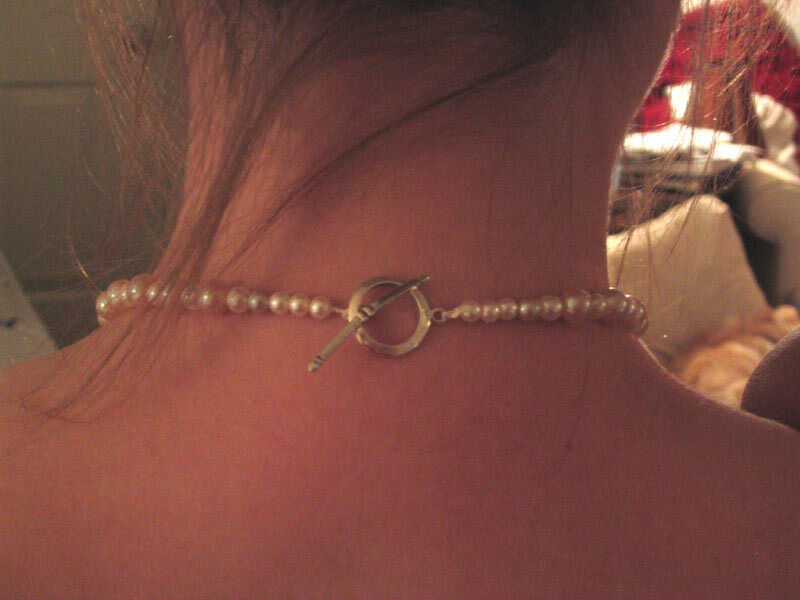 Very pretty necklace. Goes better, I agree. If you can get a strand of pearls go for it.I love wearing as many as I can get away with. Yuo have a great eye for your jewelry very nice. Yes, I think you're both right. 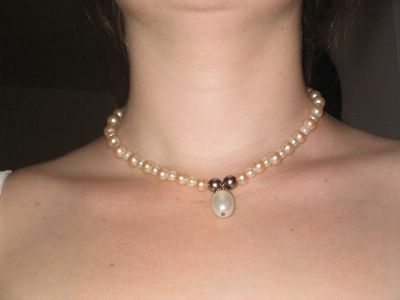 I've since strung some alternating large and small pearls (plastic, cuz that's all i had on hand, but its the best i could do). 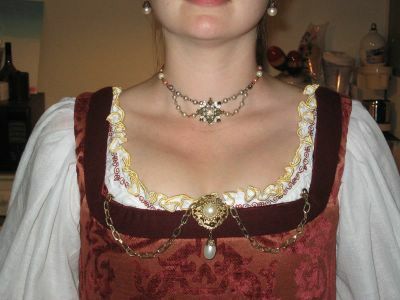 It looks much more authentic, especially since i could get a full necklace out of them, instead of just a short bit like with the chain.